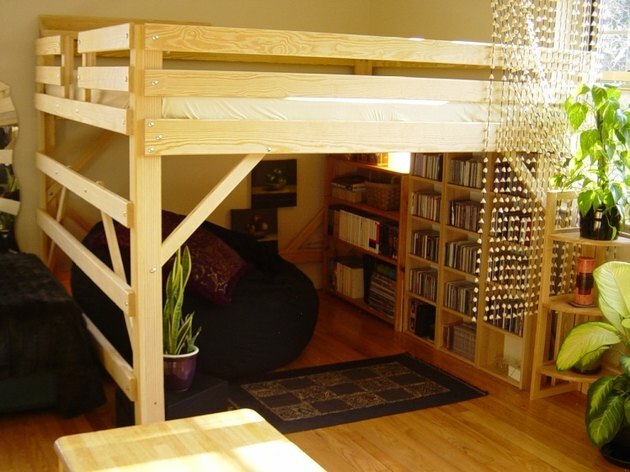 Often containing unique structural elements, loft apartments are appealing because of their high, open ceilings and unique layouts. When designing a loft space, try to highlight interesting features by adding lighting or mirrors to drawing attention to key areas. Most loft apartments have few interior walls to separate one living area from another. Because there are fewer walls, creating private areas may be a challenge. However, the plus side is that the apartment will feel larger than it actually is. When arranging furniture in a loft apartment, try creating a sense of separation between living areas by positioning the furniture so that each living area appears more clearly defined. Furniture in common areas should face each other, either arranged circularly or in an isometric pattern. Strategically placing area rugs within each separate living area of the loft may help create a better sense of definition within the space. Make sure that the view of the public sitting area is not facing the more private sleeping area, unless there is a portable wall partition or piece of furniture blocking the view. Sliding curtains are another option to add an element of privacy. Many loft apartments have oversized or unusual industrial-style windows. Utilize natural sunlight by pulling up the shades during the day. At night, soft lighting adds a charming touch. Mini-lights can be used to frame a particular feature such as a ladder or upper loft section. Centering wrought iron candlelight wall sconces on each outer wall will help add warmth and charm. Add adequate lighting to any areas of the space that seem dreary during the day. Make sure the kitchen and work/study areas are bright.